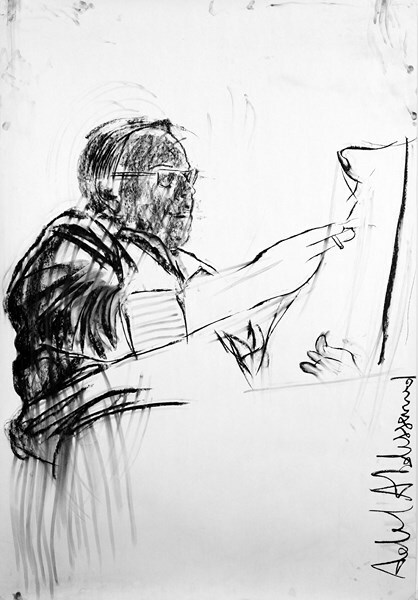 The maritime drawings by the artist Adel Abdessemed impress with their simplicity. Black lines on white paper. 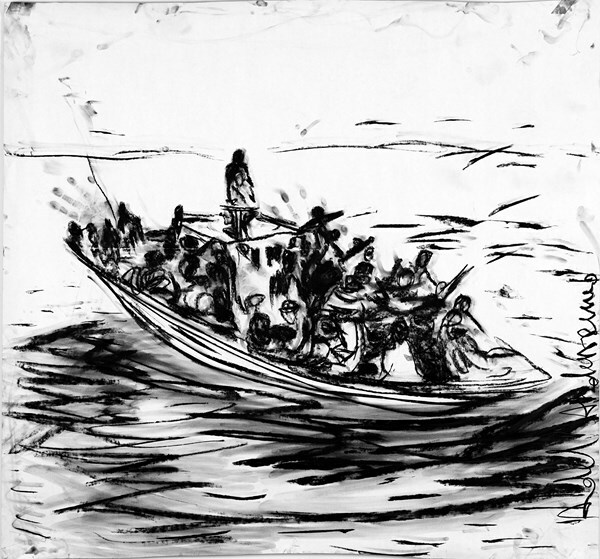 The pictures show a man reading a newspaper or a single boat with crowded people on it. Only the silhouettes of the people are shown. Neither the man reading nor the people crowded in the boat show individual characteristics. The black smeared lines on white paper appear sinister. Not much is needed to explain what we are seeing: crowded boats with people fleeing to Europe. These are pictures we know from the newspapers in the West today. 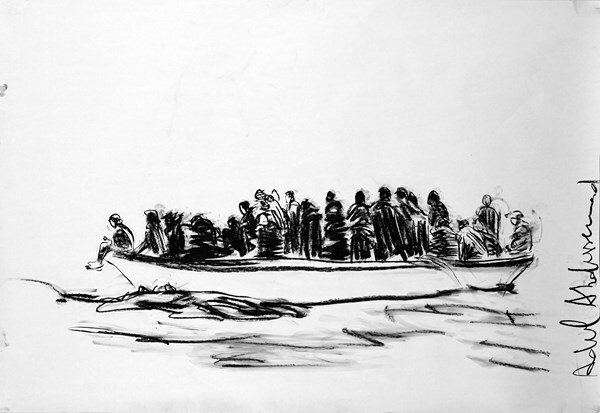 Lampedusa is the name of this series of maritime images that Adel Abdessemed drew between 2012 and 2014. The name is a reference to the small, Italian island of Lampedusa, which was until recently a tourist resort for Europeans. In the 21st century the former resort has become a refugee destination for many boat people coming from Africa and the Middle East. Adel Abdessemed’s pictures and installations mirror the current affairs of the 21st century; he questioned sad realities in the language of art. 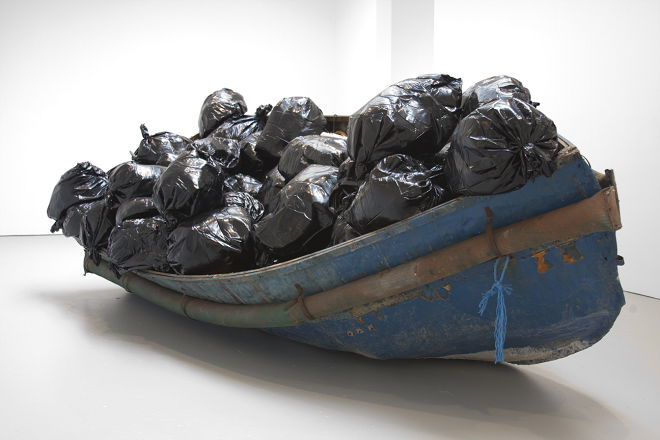 His art installation Who’s Afraid of the Big Bad Wolf shows a boat full of garbage bags, which represent people on refugee boats. This associative juxtaposition of refugees and garbage bags provides the fundamental question of the value of people. Are the refugees as worthless as the contents of the garbage bags? Of what value are these people? The current political discussion of the 21st century about the “emigrants – a burden on wealthy and prosperous societies in Europe” – puts the achievements of civilization and of humanity into question. In the last century literature discussed the same topic, for example in the famous radio drama Das Schiff Esperanza (The ship Esperanza) (Fred von Hoerschelmann / 1901-1976). Migration caused by poverty in Europe in the late 19th and early 20th centuries led to a flow of refugees from Europe to America. The text Das Schiff Esperanza deals with a captain who onboards European emigrants and earns a fortune from them. However, due to fear of prosecution, he leaves the European migrants on a sandbank rather than keeping his promise; they drown in the next flood. When the captain finds out that his own son has joined the migrants because he, like them, believed to be in America the captain is appalled. Now with his son exposed to suffering and death, he has to answer for himself. This raises the question of the value of humans one’s own value and that of strangers. Adel Abdessemed thus meets the dramas of the past, connects to the critical art traditions and bridges over to contemporary art and catastrophes. He compares his work thematically with the maritime landscape painting The Wreck of Hope / The Sea of Ice by Casper David Friedrich of the 19th century. The marine painter’s images of hundreds of ships all too often seem obsolete, and its contents are not immediately comprehensible the contemporaries of the 21st century. But their relationship to the contemporary art of Adel Abdessemed offers new interpretations of the old oil painting. What is the main topic of “old” oil painting of the 19th century? The typical subjects and patrons of these oil paintings (16th-19th century) were kings, sultans and later rich commoners. The art served as an end in itself to display their own policies, successful battles or state-supporting events, such as diplomatic encounters, and their covenants were painted on these old art works. One example is the painting entitled “The Battle of Preveza” which shows the victory of the Ottoman fleet over the ships of Venice in Preveza (Barbarossa Hayreddin Pasha Defeats the Holy League of Charles V under the command of Andrea Doria at the Battle of Preveza – 1538). At that time they were enemies, and nearly 150 years later in 1710 the painting “The Entry of Alvise Mocenigo in Constantinople” demonstrates that Venice and the Ottomans are in political harmony by showing Venetian diplomacy in front of the sultan’s palace on the Bosphorus. In the 16th century there are alliances between the French and the Ottomans (Sultan Suleyman – François I) against the British and Spaniards. 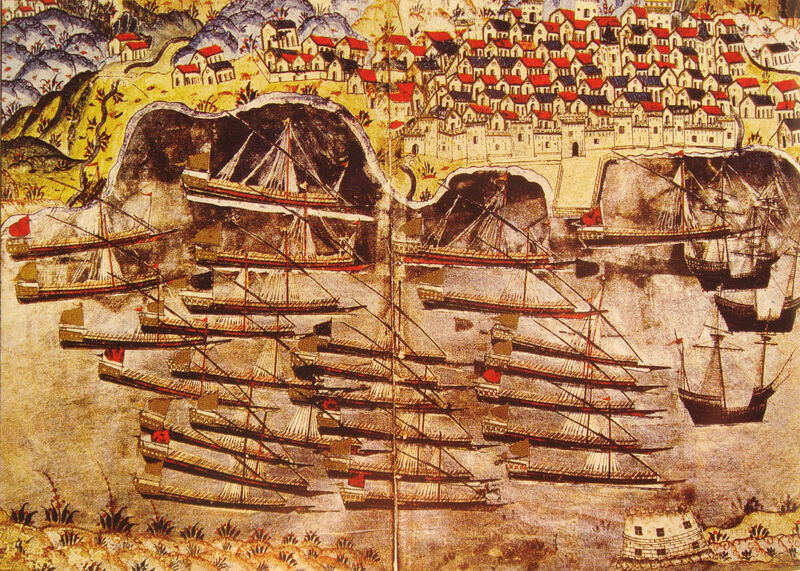 The Ottoman miniaturist, Nakkaş Osman, documented this on a miniature of the wintering of Ottoman fleet in the French Toulon. In addition to these heroic images painted for powerful patrons, there were artists who were already raising social criticism in the 19th century as the artist Adel Abdessemed does for the 21st century. In his romantic landscape painting The Wreck of Hope, Caspar David Friedrich paints a ship, a typical symbol of the power and strength of the ruling and wealthy class of the 19th century, that simply perishes in the Arctic Ocean. The ship is a symbol of power: the government and hope sink as the shipwreck sinks beneath the ice floes. The rising ice floes become tables, like tombs of the sinking ship. He dubs the image A Failed Ship among Rising Ice Floes. As soon as the next exhibition he will have to play down the title The Wreck, and two years later, it becomes only Views of the Arctic Ocean. The critical attitude of the artist to the responsibility of society also encompasses Théodore Géricault and William Turner. Another famous painting, The Raft of the Medusa, has a critical social point of view and is displayed in the Louvre museum in Paris. The painter Théodore Géricault was allowed to exhibit the picture in the Salon de Paris, but he was required to modify the title of the painting, due to the pressure of the government, to Scenes of a Shipwreck. The Salon de Paris was an important institution for art exhibitions of the government and thus the cultural pride of the respective regimes in the 19th century. Because Gericault painted the picture in heroical, naturalistic way, at first the government did not notice the criticism. Shortly before the exhibition at the Salon, the artist changed the image and added new characters into the scenery, whose explosiveness was probably recognized only later. What happened? What historical event is behind it? The painting takes a position on an event that actually occurred, and the public was very aware of, in the 19th century. A French frigate, Medusa, was on its way to Senegal, at the time a French colony in West Africa. Because of a disagreement between the officers on board, the ship had run aground. Those responsible for the capsizing of the ship survived because they occupied the only seaworthy emergency boat; the remaining 147 passengers were left on a raft that floated down the ocean currents. Soldiers from Italy, Arabia, Guadeloupe, San Domingo, India, Asia, America, Poland and Ireland were placed on the raft. Only 15 men survived; their reports shocked the public. “We could not believe we were left until the boat disappeared from our sight, but then we fell into a deep despair”, said one of the survivors. The sinking of the Medusa was seen as a symbol of the unjust conditions in France, where only the interests of the rich were pursued.The incident became a political scandal and forced a minister and many officers to resign. Théodore Géricault, inspired by the public discourse, created a masterpiece in the Old Masters’ tradition of paintings: the courageous survivors as heroes in a scene. But the new heroes did not correspond with the social ideas of the time. In the picture a black African, probably a slave, stands at the forefront of the heroic survivors. A slave is the central hero, who is supported and uplifted by the survivors. The picture shows an open criticism of the ruling class and the states where slavery had not been abolished. This European event has a predecessor in the Islamic miniature of the Turkish epic Siyer-i Nebi about the life of Muhammad, 1388, written by al-Darir . 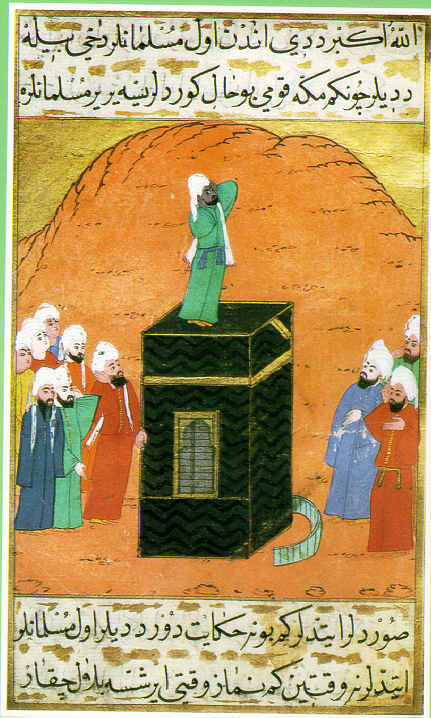 On the miniature, the former slave Bilal is at the Kaaba and calls for prayer. Again, a change in society is displayed. Bilal ibn Rabah, an Afro-Arab former slave, becomes a hero in the Islamic world and one of the most loyal supporters of the Prophet Muhammad. Bilal is a 7th-century symbol against racism and suppression in the Arabian Peninsula. The English painter Joseph Mallord William Turner also belongs to the socially critical painters of his time. In 1840, similar to his French and German counterparts, he uses the canvas to criticize the inhuman conditions in society imposed by its rulers. The Slave Ship (originally titled Slavers Throwing Overboard the Dead and Dying – Typhoon Coming On), painted by Turner and displayed at the Museum of Fine Arts, Boston, shows a dramatic maritime scene. 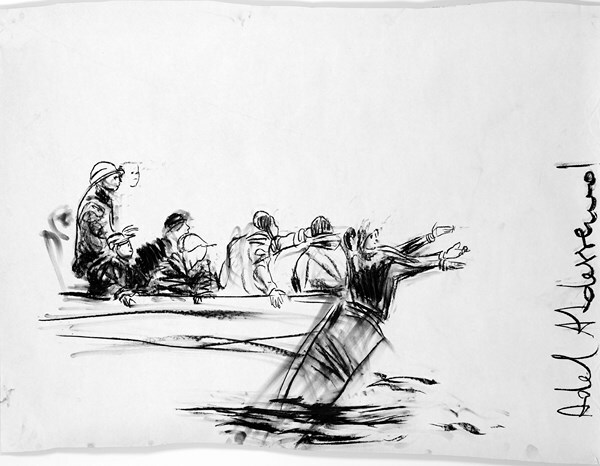 In the foreground are extended arms and legs, people in agony in the highly turbulent sea. However, the human body seems to be just food for fish and birds and doomed to death. The rescue ship disappears over a reddish orange dramatic horizon. Turner’s painting is based on an actual event from 1781: as instructed by Captain Collingwood on the British slave ship Zong, 133 slaves were thrown overboard to gain insurance money (around 30 pounds per slave) for the “loss of goods” at sea. Turner paints no heroic images. He represents nature affected by light, as he perceives it subjectively (Impressionism). He also enriches content by bringing new topics to the forefront, such as social injustices. Turner is the “key figure in the transition of the painting to the historical modernity”. He was a role model for the socially critical nature of Impressionism and 20th century abstract art. In the 21st century, 300 years later, the topic of “human dignity” remains a key and unfortunately pressing topic. Although contemporary art and the old oil paintings may not change the world, art can ask three questions, which must be resolved for a civilized world. Art questions politics, pointing out its beneficiaries and their lack of ethical values. It questions social injustice, making the individual the centre of its narration. Last, art questions humanity and the behaviour of human beings when facing the “others” and other cultures. Adel Abdessemed calls for viewers’ reflections in his works Lampedusa and Who’s Afraid of the Big Bad Wolf and asks viewers to review their perceptions while creating a new reflection on the political and social conditions in our century with the dramatic events that take place in the Mediterranean.